Good scrum from Tonga and they advance up over halfway. Tonga looking good as they move into their 7th phase 15m out. Tonga 5m out now and they have a penalty advantage. Tonga going nowhere so the ref blows for the penalty. What's their mindset going to be? Kick or go for it? Tonga will kick for goal. Points on the board is the call. Kurt Morath slots the penalty and Tonga are on the board. Oh dear. Naholo has just had a severe case of butterfingers when it looked like the All Blacks had to score. A fortunate bounce from a Tongan clearance opened the gate for a speedy ABs counter attack but with an overlap out wide and space to burn, Naholo dropped the simplest of catches and we will restart with a Tongan scrum on their 22. All Blacks on the march now. They look good down the right flank and make good metres with a number of clever offloads. They move the ball back infield and Dane Coles tries a kick in behind. Very strange option from Coles and it doesn't work as his kick went flat and the momentum was killed. The phase ends with an ABs scrum. Tony Woodcock has his first try since the World Cup final in 2011. Great set piece from NZ. Milner SKudder, Aaron Smith and Kieran Read all had big parts to play, but Woodcock finished it off well. Carter slots the conversion from right in front. All Blacks lead 14-3. Just seven minutes left in the first half and the All Blacks have scored two good tries, among a host of knock-ons and basic errors. Tonga have been impressive at the scrum and breakdown and have just earned another penalty inside their own half. Tonga win the lineout and quickly spread the ball wide left but the final pass is clearly forward. 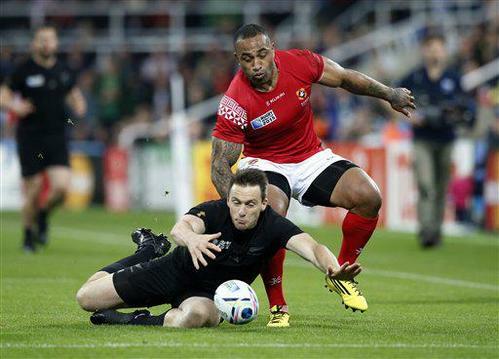 The ABs have been penalised for a dangerous tackle by Ben Smith and Tonga have another penalty on halfway. Morath kicks for touch again and Tonga have a good attacking lineout chance 10m out. Great lineout drive from Tonga brings them within 5m of the line. 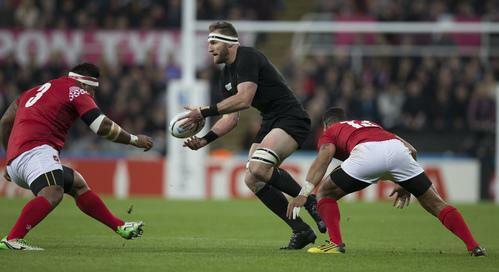 Kieran Read has been sent to the bin for intentionally dragging it down. Tonga have a penalty right infront and NZ are down to 14.
cant see hansen being happy with this half. Just two mins left in the half and Tonga have opted for the scrum right infront. Another Tongan penalty. There is real pressure on the All Blacks scrum here. The ground is really tearing up here. Can't imagine Newcastle United will be too happy with these scenes. Another penalty to Tonga. That's three in a row and now the ref is talking to Conrad Smith. Time is up in the first half but we are re-setting another scrum right in front. What spin will the coaching staff put on this display? Struggle street in Newcastle. Tonga with the ball still right on the line. The ref has signaled upstairs. He wants to see if Tonga got the ball down. Tonga were perched within 5m of the line for about a minute but couldn't get through. Are the AB's ever going to look dominant? Group stages or not this is becoming tiresome. This team looking like World champions to you? we still look out of sync;no great improvement from the last game. NO TRY! The ref blows for halftime. The All Blacks have dodged a bullet there. It's halftime and the ABs lead 14-3.